As some of you you may recall ( OfGardens July 16, 2013 Daylily Delights) I am having a real summer crush on day lilies. After many hours of sighing and coveting the day lilies of others, I decided to be proactive and pursue my new love interest. I have created my own day lily bed. Here in Nova Scotia where I spend part of the summer there is an excellent day lily nursery, Canning Daylily Garden (http://canningdaylilygardens.yolasite.com), which I have been wanting to visit for quite some time. On a gorgeous summer’s day, a friend and I drove to Canning with a long list of wants. Almost immediately upon arrival Ryan Ward, the owner, greeted us and offered help. From that moment until we drove off he never left our sides and was extremely helpful in every way: he found the day lilies on our list, chose from those available the ones with the largest fans, packed them up, carried them to the car, loaded the car AND gave us each two free day lilies because of the number of plants we purchased. We had a lot of fun acquiring the day lilies, which is always a good harbinger for a project. 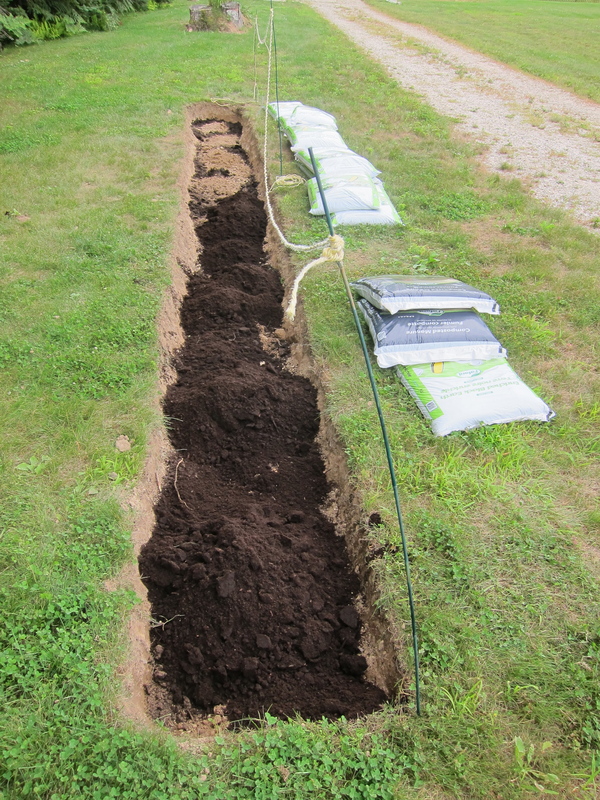 and then the rest with a combination of old and new soil. 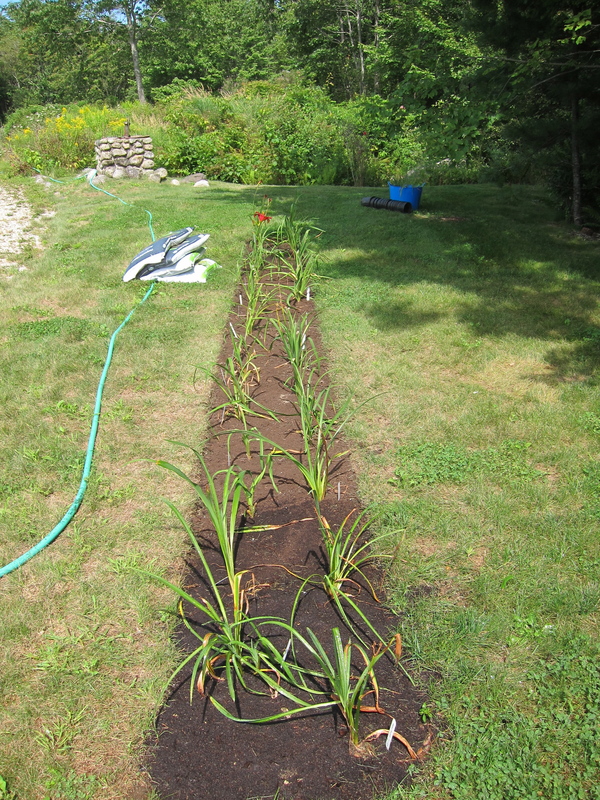 I then planted the day lilies 20 inches apart, more or less. This is a little wider apart then most often recommended, 12 – 18 inches is the popular recommendation, but I don’t want to have to divide the bed anytime soon so I over compensated with space now. Watered deeply (and often since), then mulched. It is so easy to plant in a new bed filled with fresh soil! There is a home here on River road with an extraordinary planting of day lilies – it is the same lovely home with a new & growing orchard going up the hill – I think Patrick lusts after it. Just kidding. Anyway they have a wonderful collection including a variety that seems white although it may actually be a very very pale yellow. How lovely! I hope to see it sometime. Gentle Shepard is the only real white daylily I know of…Joan Senior is white, with too much yellow for my all white garden. But there are a lot of pale yellow. 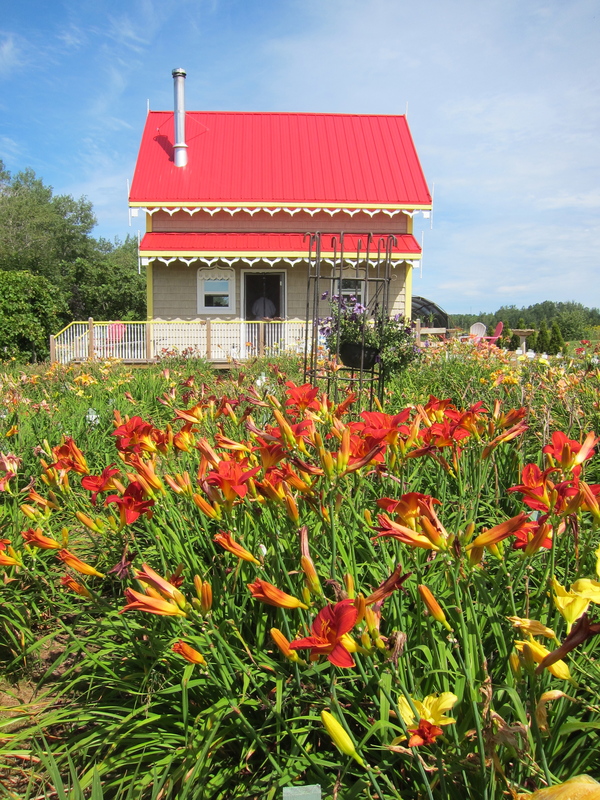 What a sweet little house Ryan Ward has in his Canning Daylily Garden. He should sell the whole package, little house and day lilies! I totally agree! The red roof with the fringe is adorable. A great backdrop for the day lilies. What a surprise – to see your post about the Canning daylilies. Canning is located just over an hour’s drive from Chester and our garden club has benefited from many fine specimens purchased at Ryan’s nursery. I hope you have a great holiday at your cottage. Hi Jo11anne. Missed meeting you at the Chester Garden Club lunch at Sandy’s last week. Hope our paths cross this month. Boy, what good treatment. I hope my poor scratched-in daylilies don’t hear about this. I like the mixed reds scheme. Usually you see yellows and oranges. I like yellows and oranges, but the reds are so bold and I will look at the bed from far away. my daylilies are nameless inherited orange ones, neglected and admired when they bloom despite me! Next year, and the next your newly planted bed will be daylily heaven. the orange daylilies are stalwarts in gardens in my part of the world, affectionately nicknamed “ditch lilies”! I love them, too, but since I had the opportunity to start from a blank slate, I liked the idea of all read, not a very common daylily color. In a year or two, the display should be spectacular! I have Baja and love it. I am looking forward to a spectacular display. I am glad to have your endorsement of Baja. It was in bloom at the nursery and I love the intense red. The nursery owner said Doug’s Red Mercedes was the best red they had, but it wasn’t in bloom so I haven’t seen it yet. If it it better than Baja I will be a very happy gardener. Those daylilies are getting some deluxe treatment! The varieties you picked are beautiful. I think my favorite is called ‘Eye-yi-yi’. Eye-yi-yi is a good one, I have it elsewhere in the garden and love how long it blooms. Any suggestions of all red daylilies will be appreciated and considered! I have one called Chicago Apache which is a pretty good red. We used to have a ton of daylilies of all different kinds on the farm where I grew up. I particularly loved a soft peach colored one and also the soft yellows. Your pictures are beautiful. 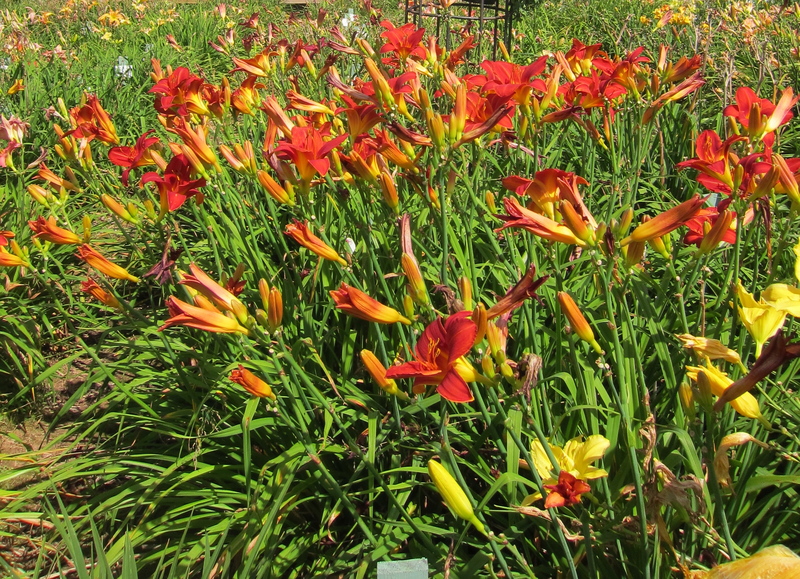 One of the best attributes of daylilies is the myriad of colors they come in. I like that you grew up on a farm that had “a tone of daylilies of all different kinds”. Thanks for your compliment about my photographs! 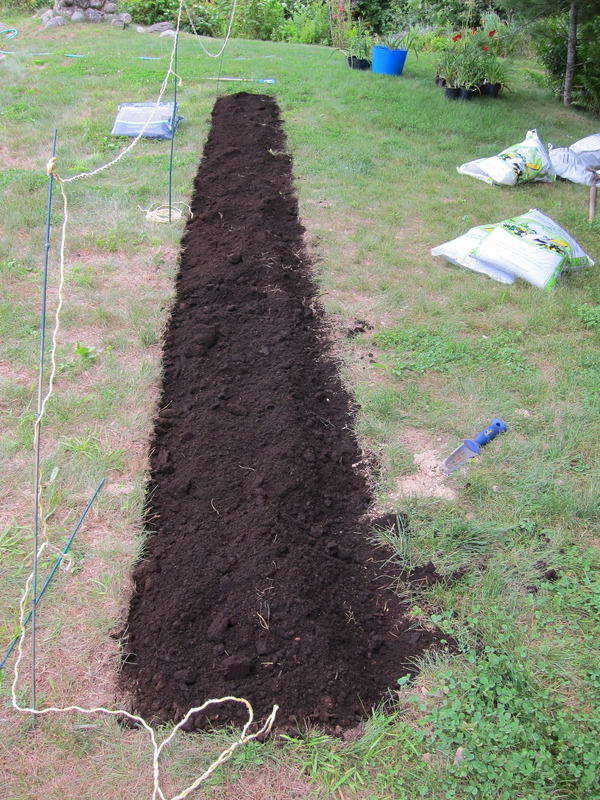 (see ofgardens July 16, 2013 post). I highly recommend a row. I’ll keep you posted on progress. Thanks. Looking forward to seeing the results of our labor next summer! I love daylilies and fall for them over and over. But the ones I have do seem truly to just bloom for a day – which is fine, – but they don’t shed their dead flowers and the result tends to look manky. Spoiling the overall effect. Do you think this is about the varieties I’m growing? Daylilies don’t shed their dead flowers. If you want your day lilies to look pristine, you will have to “deadhead” them yourself. I don’t mind the faded flowers, although I do deadhead them whenever I get the chance. 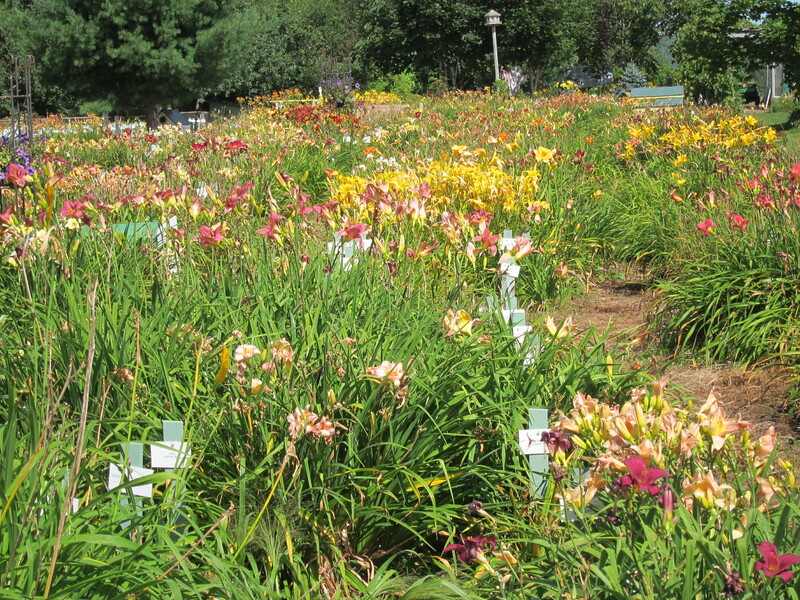 I have one friend who has a serpentine bed of hundreds of day lilies, he deadheads his! O. Hmm. Don’t quite see how it’s possible to look at something with real pleasure if you’re also seeing hundreds of deadheads needing careful removing. And if you’re not careful you take off buds too! Doh! But they are beautiful. Are the nearer to species better looking with their deadheads than the later hybrids I wonder? Interesting question, I don’t know. I will try to find out. Good question…I don’t know the answer, I will have to find out. Personally, the spent blooms don’t distract me. I deadhead very occasionally and let nature take it’s course.